This week, I still have lots of sewing projects on the go. The only things I finished this week were the zippered pouches. I am still working on the rattle cubes and the pink and sparkly bunting. 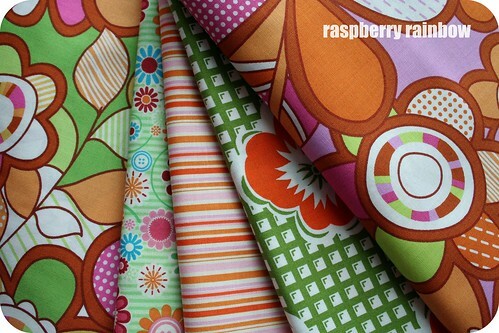 This gorgeous collection of green and orange fabric is destined to be bunting for my besties daughter for Christmas. She is 6 years old and I love it that pink is not her favourite colour like most other girls her age - she loves orange. It is a refreshing change to be sewing with some colours I would not normally have chosen for myself or my girls. I am waiting for the just washed fabric to dry. That won't be too long as it is still warmish here in Hong Kong, most days this week have been in the low 20's (celsius) The stifling heat of the past few months, I hope, is behind us. All the other lovely Creative Spaces are over here. Happy browsing to you. Gorgeous fabric!!! 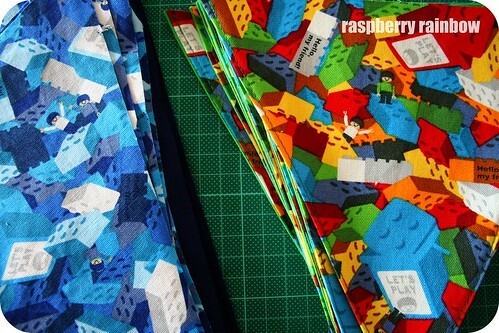 And that lego bunting is flippin awesome! Must be so fantastic to explore all these places. Beautiful -this project will be so pretty! Nice to meet you, Cat! I had so much fun scrolling through your blog that I wanted to drop a quick note to say "hi". That fabric is going to make fabulous bunting! I am sure you will find a whole emporium of thread somewhere there.